The Monster 797 is the most affordable Ducati on offer, barring the Scrambler range, of course. 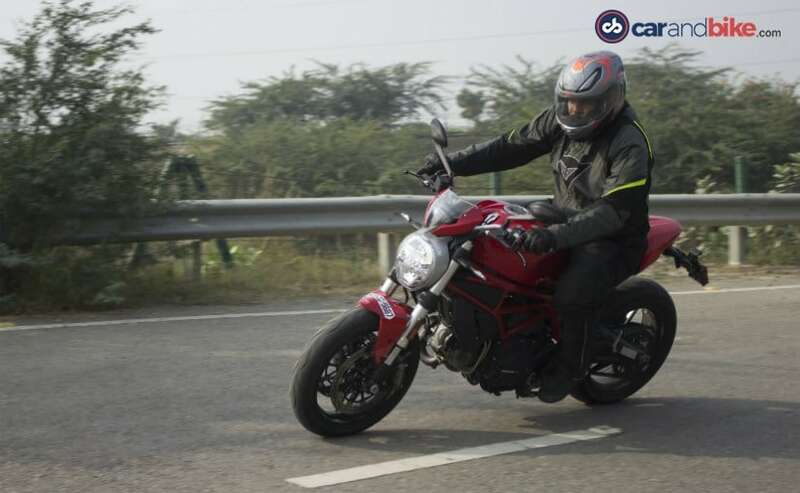 While we got our hands on the Ducati Monster 797 in Thailand earlier this year, riding it on Indian roads has been a complete experience altogether. 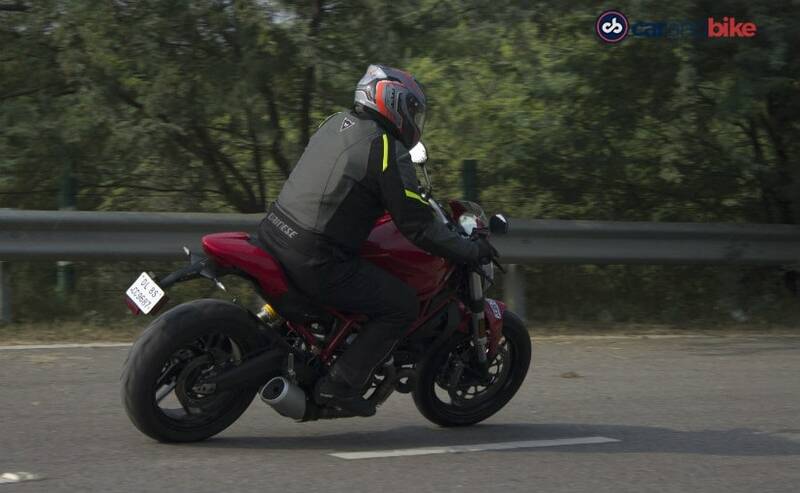 The Monster has been an integral part of Ducati's range in India. But apart from the Scrambler series, Ducati did not quite have a motorcycle that could have catered to first-time performance motorcycle buyers. Something that was purely Ducati and not a Scrambler! 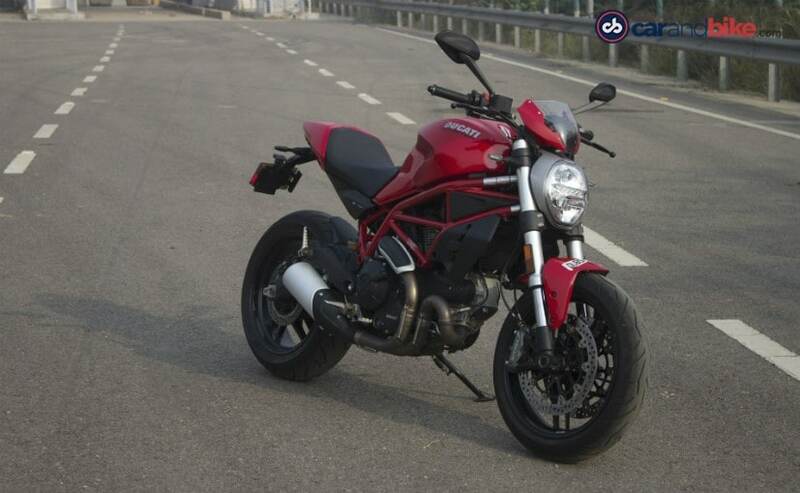 Enter the Ducati Monster 797. 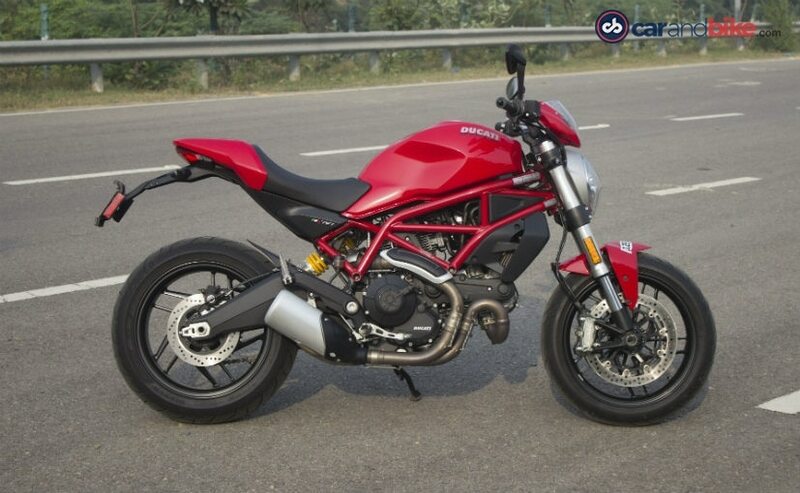 It the most affordable Monster model and according to Ducati, it could the perfect bike to upgrade from 300 cc - 400 cc bikes and get into the big bike league. But is that the case? Here is what we think. For someone who might be upgrading from a KTM 390 Duke or a Kawasaki Ninja 300, absolutely yes! 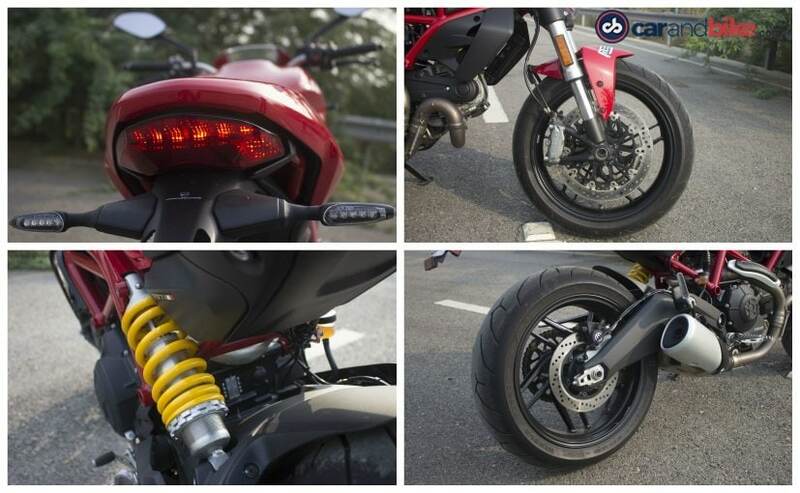 The Monster 797 carries the typical styling and design of the Ducati Monster range - Bulbous fuel tank, brawny looks, fat forks, fat tyres and an exposed trellis frame. It draws eyeballs for sure and when we were out with the bike on the roads, it sure did! So, the lust factor certainly gets a thumbs up! It will satiate a new big bike buyer's desire to show off. For an entry-level big bike, the Monster 797 skims on a few fancy features. There is no ride-by-wire, no riding modes, no traction control and no fancy electronics either. There is a switchable Bosch ABS unit (anti-lock brakes) though. The LCD display doesn't have a gear position indicator and a fuel gauge display. Considering that the bike was meant for first time big bike buyers, these should have been on the instrument console. But the bare essentials, it does get! And by that we mean, 43 mm Kayaba forks upfront, an off-set Sachs monoshock at the rear, Brembo Monobloc M4.32 callipers with four pistons upfront on 320 mm twin discs and a 245 mm disc at the rear. The bike is shod with sticky Pirelli Diablo Rosso II tyres, a 120/70/ZR17 unit at the front and a 180/55/ZR17 at the rear. So the cycle parts are top-shelf. Additionally, you also get an LED positioning lamp on the headlamp, LED tail lamp and a USB socket under the seat. 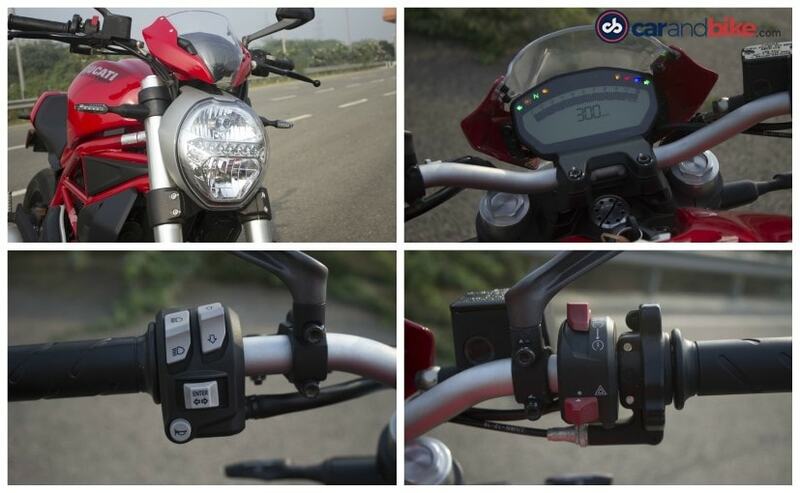 The bike can also be configured with the Ducati Multimedia system (DMS) which offers Bluetooth through which the riders can connect their smartphones and use it to manage the music player, get notifications for messages or phone calls. Our test bike came fitted with LED indicators, a rear seat cowl and a flyscreen on the headlamp, instantly making the bike look even sportier all of which were optional. So, for an entry-level bike, it is NOT all-show and no go. The bare basics are there! Sounds good, but what about the engine? 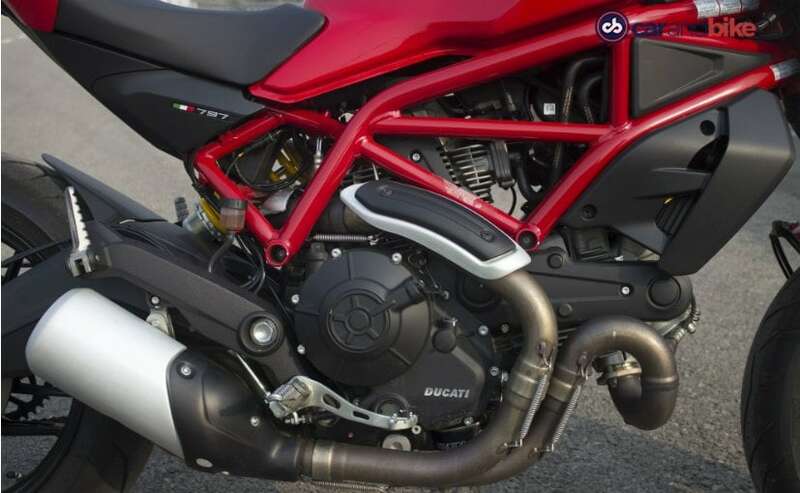 The engine on the Monster 797 is the same as the Ducati Scrambler's. It's an 803 cc L-twin motor, which is air-cooled, but churns out a decent 72 bhp at 8,250 rpm and makes a peak torque of 67 Nm at 5,750 rpm, the exact same figures as the Scrambler. The gearbox too is the same as the Scrambler, a six-speed unit. As far as weight is concerned, the Monster 797 weighs 193 kg and the Scrambler Icon weighs 186 kg, a difference of barely 7 kg (wet weight). How is the performance of the bike? A rather interesting question, this! Our riding experience of the Monster 797 revealed that the engine is punchy. The meat of the torque comes in quite early on the rev range. This means two things. One can cruise at high speeds on low RPMs and also there is ample power on tap should you twist the throttle. The bike delivers the power in a measured way - not so swiftly that a newbie will be alarmed, and neither so slowly that the bike loses out on the fun quotient. Three-digit speeds are dispatched easily and the bike pulls cleanly when given the beans. It will keep you entertained, but the bike is vibey though. You scrum through the gears and accelerate hard and feel the vibrations getting to you through the palm grips and the fuel tank. And then, there is the perennial problem of the engine heat making things uncomfortable in traffic, if you're thinking of doing the daily commute. How is the handling and the ride quality? The suspension is stiffer than we would have liked. You will feel all the ruts, bumps and potholes riding up your spine, especially at city speeds. But the positive is the slick handling. The bike can cut through traffic as easy as any 150 cc - 200 cc commuter or even a scooter for that matter. Show it a set of corners and you will see that the bike is more than happy to take them on. The Pirelli tyres prove their worth here, and handling is Monster 797's forte. It will egg you to go harder with every passing corner. What about the pricing and its rivals? The Monster 797 is priced at ₹ 8.05 lakh (ex-showroom, Delhi) and its chief rivals are the mental Kawasaki Z900 and the sophisticated Triumph Street Triple S.
Does it make sense to buy one? A curveball this question is! 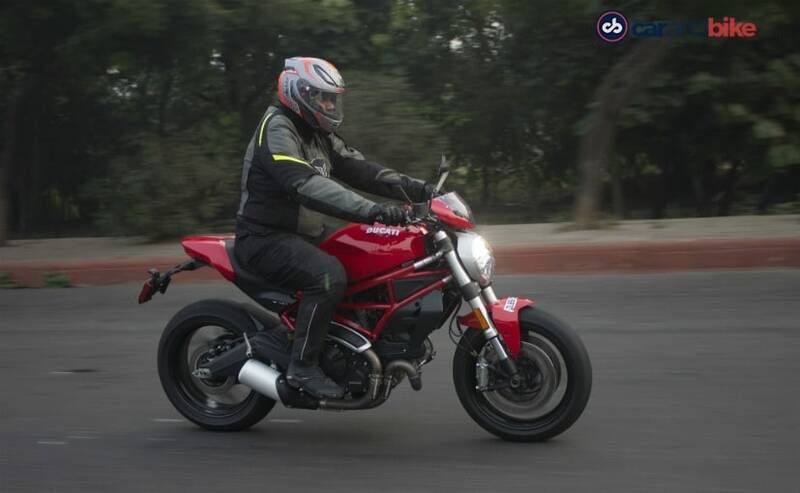 The Ducati Monster 797 does almost everything right. The performance is good and the bike also gets quality cycle parts. There is no problem as such with the bike, but the problem lies in the competition. Both the Street Triple S and the Z900 offer a lot more power and better performance. The Street Triple S gets a much longer list of features too. Pricing wise, the no-frills version of the Z900 will cost you ₹ 7.68 lakh while the Street Triple S costs ₹ 8.71 lakh (ex-showroom, Delhi). One is slightly more affordable while the other is a tad more expensive. Both bikes offer more value for money, at least on paper. 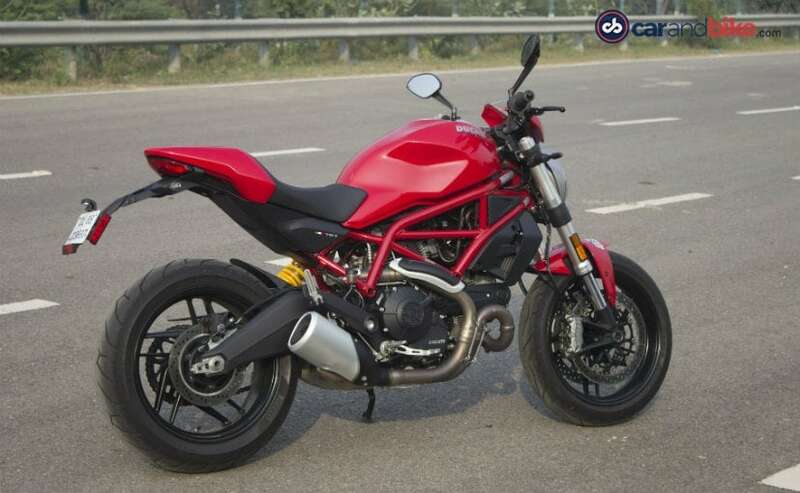 But if you fancy yourself to be a Ducatisti, and you want a sporty naked, then go right ahead, take a good look at the Ducati Monster 797, it may be just the bike for you.